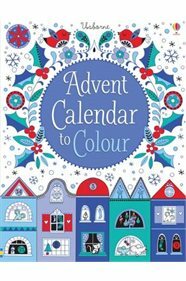 "A fold-out advent calendar featuring a black and white street scene, to colour a bit each day in the run-up to Christmas. There are doors and windows to open daily, and lots of friendly mice to spot. Stand up to create a festive display, or fold away like a book for storage."